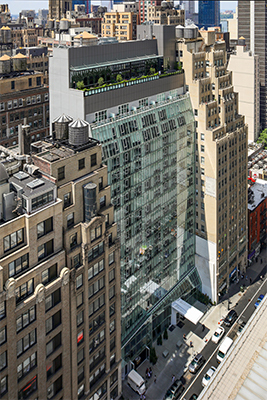 This exciting hotel, which opened in spring 2018, is right across West 40th Street from the iconic New York Times building. 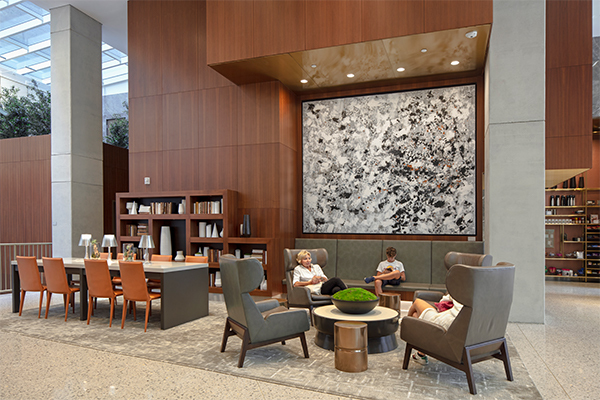 The project, for which Helpern Architects is both the architect and interior designer, is our third hotel for OTO Development [Fairfield Inn & Suites, Hampton Inn]. 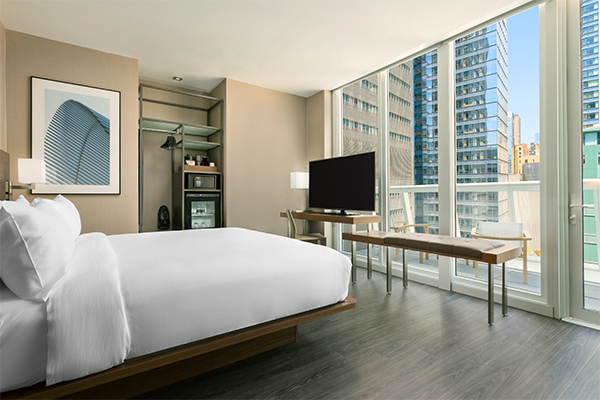 This first AC Hotels by Marriott© property in New York City represents the best of an “entrepreneurial lifestyle brand.” The flag targets cosmopolitan millennials and gives a European vibe – understandable because AC Hotels started in Spain and is now in 15 countries. There are 290 well-sized guest rooms. 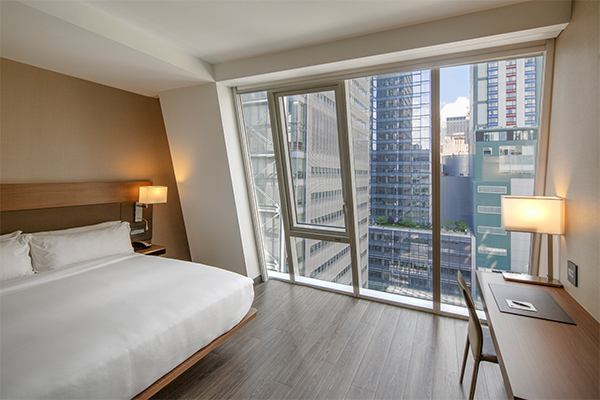 The top three residential floors feature the largest guest rooms: those on the 19th Floor feature terraces, while those on 17 and 18 have top-to-bottom sloped glass windows. 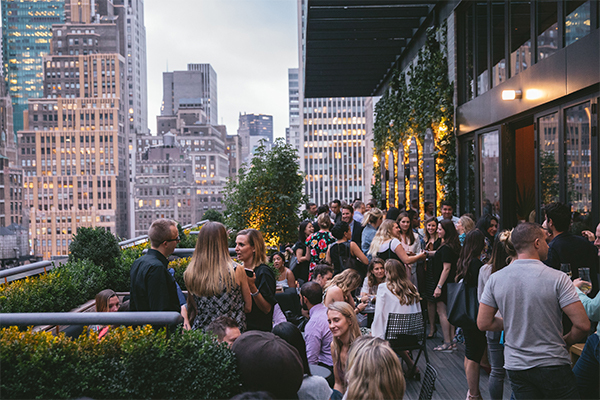 The 21st Floor rooftop bar/lounge and its planted terrace offer an amazing view of the Empire State Building a few blocks away. 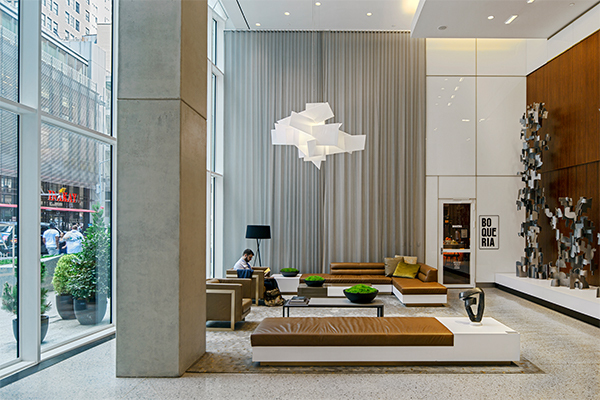 AC hotels are distinguished by their attention to Design – note the capital D – which is rare even for a four-star hotel. “Unpacked,” AC’s worldwide branding video campaign timed to the opening of this property, features a video interview of David Helpern about the importance of Design to the experience of hospitality. To view the video, click here. According to Helpern Design Principal Karl A. Lehrke, the building is intentionally set back to create a V-shaped, granite-paved plaza. 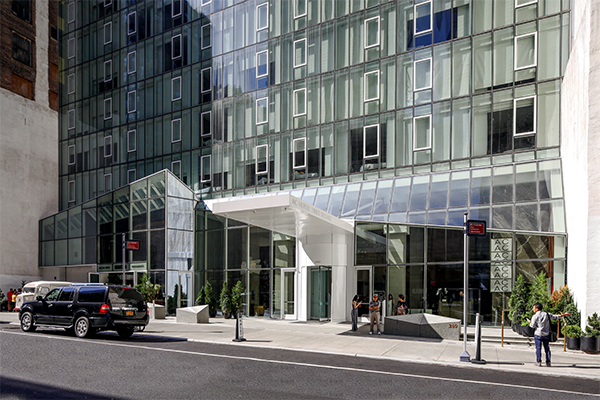 An 11½-ft-wide cantilevered white metal marquee extends 15 feet above and 40 feet way out to the street. 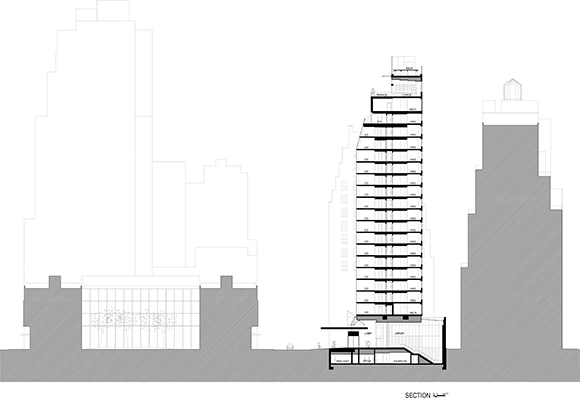 The glass-and-aluminum curtainwall façade angles back at the top floors. All windows on the street side have full-length windows. The pleated glass base rises 28 feet to the second floor, then dips and folds dramatically. Its shape refracts light and also identifies the two entrances: one to the west to the hotel, and one to the east to the third-party street-level restaurant. 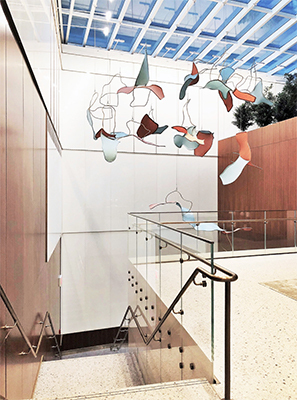 Sloped glass reappears in the shed roof atop the rear wall of the 23-ft-high lobby; it illuminates a grand staircase to the meeting facilities and fitness facility on the lower level. 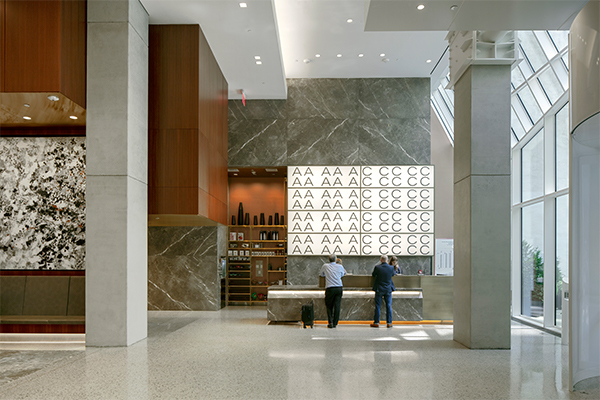 Distinctive interior materials that reflect the AC flag’s design include large-aggregate Venetian terrazzo; honed grey white-veined Italian marble; quarter-sawn dark walnut millwork; and statuary deep-bronze strips on the floor, cabinetry, and elevators. 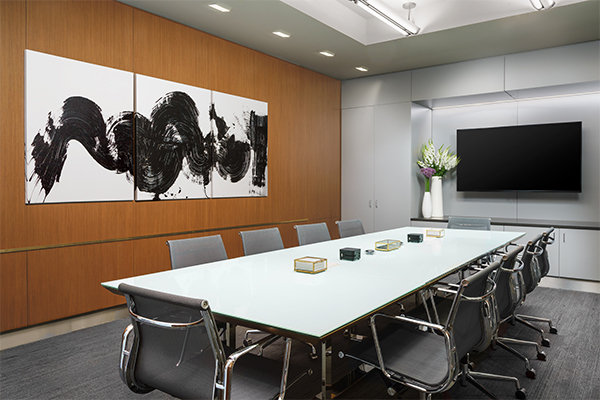 All the shared spaces were designed to display an array of original contemporary art, another AC hallmark.